This post is courtesy of our contributor Kristie…Planning birthday parties is one of my favourite things about being a mom. I love seeing the joy on my children’s faces when they see the place all decorated and are having fun with their friends and family. Planning birthdays seemed much easier when the kids were young, you pick a theme and buy everything you want to go along with it. As kids grow into teenagers, it becomes a bit more challenging as they tend to want to pick things out that don’t always match the theme. Last week my daughter turned 14 and we decided on a Christmas shopping and a movie theme. We decided to make a simple receipt-style invitation by downloading a receipt font and typing out an invitation using Microsoft Word that looked just like a store receipt. 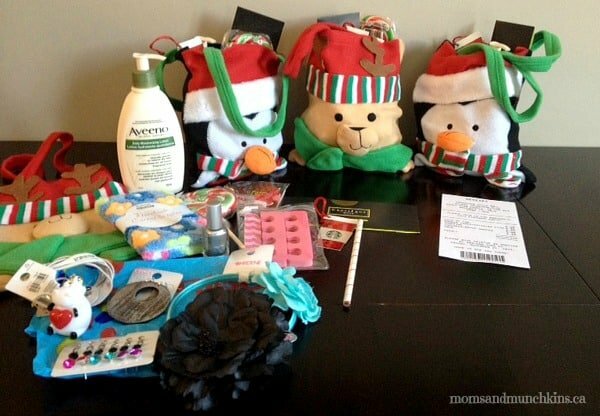 We then went to our local dollar and craft stores and purchased fleece Christmas bags and filled them with a mall gift card, Starbucks card (so each girl could enjoy a hot chocolate while they shopped) and a few goodies to enjoy after a long day of shopping. We thought the best fit would be a beauty theme, which included a small pedicure package, nail polish and our favourite Aveeno Daily Moisturizing Lotion which is perfect for Calgary’s dry winters! 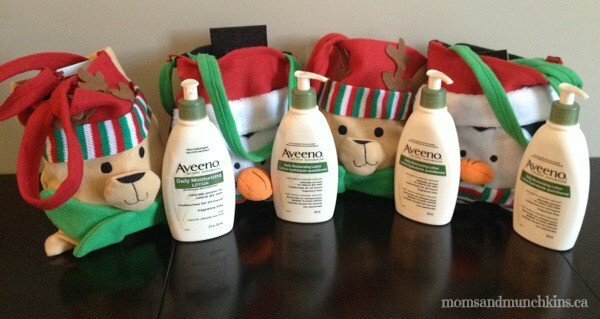 My daughter loves the Aveeno Daily Moisturizing Lotion so it was the perfect addition to their beauty themed swag bags. The Aveeno Daily Moisturizing Lotion is fragrance free and non-greasy so it’s perfect for sensitive skin. It contains Aveeno’s famous blend of natural colloidal oatmeal with rich emollients and it is clinically proven to moisturize for a full 24 hours. It’s something that we always have in our house so it was nice to be able to include one of her favourites in her friends’ treat bags. Overall the party was a success. The girls enjoyed the movie Hunger Games: Catching Fire, they ate some homemade cupcakes while opening presents and then headed throughout the mall to enjoy their hot chocolate while doing some shopping! Although not everything matched from invitation to cupcakes, the girls had a blast and my daughter felt successful helping plan her own birthday party! For more mall birthday party ideas, check out this Teen Mall Party post with a free printable mall scavenger hunt game. Don’t forget to visit our Birthday Party page for other theme ideas, free printables, planning tips and more! We’re always adding new party ideas so follow along on Facebook, Twitter, Pinterest and Bloglovin’. *Disclosure: We were given products in exchange for an honest review. All opinions expressed here are my own. it still taxes are the fact of life. ‘ I think he must have been thinking of Andrew when he said it. Very cute idea. – Which font did you use if you don’t mind me asking. Hi Jenni! This font is “courier new”. Hi Keri! I’ve sent you an email with the receipt. Please let me know if you didn’t receive it. I hope you have a great party! I would love a copy of that receipt as well for my sautéed 13th bday! Hi Amy! I’ll email that over to you shortly. Please let me know if you don’t receive it today. Would you be willing to share your receipt? I would LOVE to use these for my sons bday party thank you! Hi! I would also love to edit your receipt for a mall birthday invitation. Any chance you could share it again? Hi Pam! Please let me know if you haven’t received an email from me. Thanks! My daughter LOVES this Mall Birthday idea. Would you be willing to share your receipt with me? Hey there! I really like the “receipt” invite! May I also get this from you? 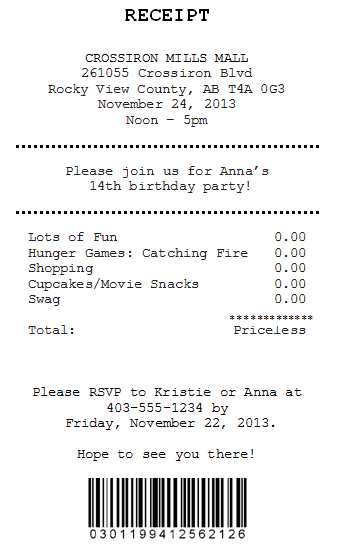 My daughter is turning 13 at the end of month and we’d like to send these invites. Love, Love , Love, My daughter is turning 12 in April, I would love to edit your receipt of a mall birthday invitation, Can you please send with me? Hi Rylee! Absolutely! I’ll send it to you via email right now. Please let me know if you don’t receive it. Hi there, can I also get a copy of the receipt. My email is missvergara@yahoo.com thanks!!! Could you please share your receipt with me? Thank you! Hi Stephanie! I’ve sent you an email – please let me know if you didn’t receive it. Hi Nid! I’ve sent you an email – please let me know if you didn’t receive it.